Michael Welch, from the Redmond Association for the SPoken word (RASP) thanked FOMP for the grant which provided seed money for the Poets in the Park event. He stated that it had been an essential step in what was a very successful event. Registration closed due to demand. Attendance was 60+ paid attendees, with 85 total including staff and volunteers. Michael reported that there was publicity in many newspapers (Focus on Redmond, the Sammamish paper, the Seattle PI, the Seattle Times, the King County Journal, the Redmond Reporter), with some stories appearing in some newspapers and some with simple calendar listings. In any case, the publicity worked, as there was a lot of walk-in "buzz". Michael gave a big thanks to Premier Properties, which manages the Clise Mansion. He said their staff was very helpful. RASP would like to reprise Poets in the Park in 2005, on either the 1st or 2nd weekend in April, and would like FOMP to partner again. In 2005, they would like to offer some student scholarships. Michael reported that local area businesses were promoted. Comments were made that RASP could be eligible for tourism grants from Redmond. See http://www.poetsinthepark.com/ for a retrospective look at this year's Poets in the Park, along with some photos. Robert Foxworthy, Capital Planner with King County, is writing planning criteria for Marymoor. These will provide a structure for evaluating development proposals. Robert's assignment is an outgrowth of the Parks Task Force conclusion that revenue should be generated within the park. They are tasked with generating $1.5 million/year. This process is in the preliminary stage; Robert has been meeting with KC staff as well as representatives from the City of Redmond and with Greg Helland and Michael Hobbs from FOMP, and others. The 1995 Master Plan is providing some initial guidance as well as a lot of baseline information for the process. Robert pointed out that areas suitable for development are few within Marymoor, as much of the land is under environmental or historical constraints, or has already been developed. A committee is being formed to help develop these criteria, and FOMP will be represented on that committee. The full committee will meet first May 13th and again on May 25th, with meetings periodically thereafter. While these criteria are being developed, a few projects are proceeding, while others have been tabled until the criteria are developed. The criteria that result from these meetings will have some legal standing, as they are required by ordinance. However, they are not immutable, and can be changed through the same process by which they were created. In discussion, FOMP members requested that advertising/signage guidelines be incorporated into the criteria, and that there be some general policies crafted which would guide appropriate development. Robert also reminded FOMP members that they are searching for ideas for revenue generation. Above are the designs discussed by Tom Teigen at the March meeting. He was unable to supply them electronically at the meeting, and email problems prevented your humble webmaster from emailing them out over FOMPLIST. They were posted on the FOMP website in time for comments to be sent to Tom (he requested comments by May 4th. Tom presented a rough schedule for installation - the track logos have already been painted. 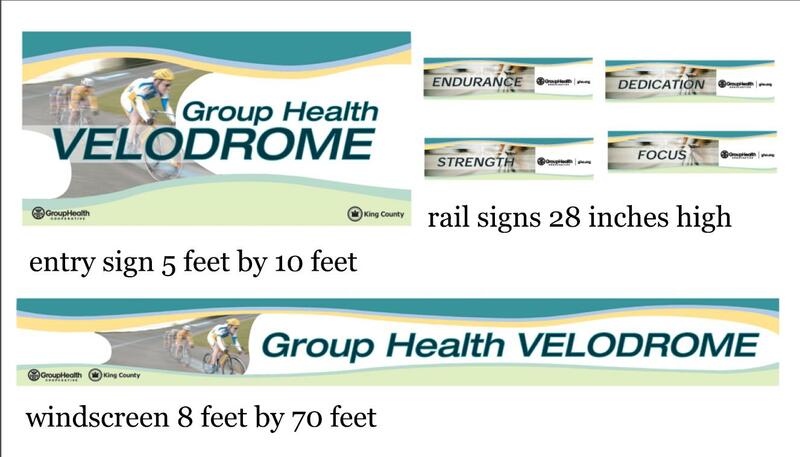 Poles for the banners were set to be installed by early May, with track panels a couple of weeks out. The entrance panel would be installed when it becomes available. A big to-do is planned - maybe including an official press conference. There was a suggestion that FOMP could open a Visitor's Center with information, a bookstore, gifts, etc. It would be a good amenity to the park, and would generate revenue. A site, and a supply of volunteers would be necessary. New signs are coming ASAP to replace the signs within the park that give directions to specific locales. These are of a new, standard design, and are blue with white writing. They will be installed over the next few weeks. The bunker-style restroom near the tennis courts will be replaced starting in June. The one near the velodrome is scheduled for replacement in 2005. The new restroom will contain a new concession stand facility, and Tim is working to get a national fast-food sandwich outlet into that stand. This could generated around $30,000 annually. The large athletic field proposal by Lake Washington Youth Soccer Association is on hold pending satisfactory financing. There will be a public forum to discuss sound issues prior to this season's concert series. Details will follow. Tom is interested in a Marymoor Holiday Lights festival this winter (11/26-1/2). This would be a big deal, and would provide lots of revenue, but might create access problems into the park. Michael Hobbs told the tale of the Great Horned Owls which nested southwest of the maintenance barns. The babies (2) left the nest before being able to fly, and ended up spending two days on the ground. The Clise Mansion grounds, however, are not suitable for baby owls (no cover, too many people), especially as these young owls seemed to prefer the kid's play area and the concert venue for their day roosts. So the babies were captured and have been taken to a wildlife rehabilitator where they are being raised by foster parent owls with plans that they will be released into the wild. The next meeting will be May 26, 2004.